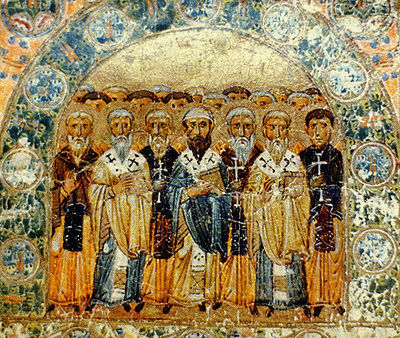 The Church Fathers or Fathers of the Church are influential theologians and writers in the Church, particularly those of the first five centuries of Christian history. The term specifically refers to writers and teachers of the Church, not saints in general; usually it is not meant to include the New Testament authors. 1 Who are the Fathers? The Desert Fathers were early monastics living in the Egyptian desert; although they did not write as much, their influence was also great. Among them are Ss. Anthony the Great and Pachomius the Great. A great number of their usually short sayings is collected in the Apophthegmata Patrum. A small number of other Fathers wrote in other languages: Ephrem the Syrian, for example, wrote in Syriac, but his works were widely translated into Latin and Greek. Though the Roman Catholic Church regards the 8th century St. John of Damascus to be the last of the Church Fathers, the Orthodox Church does not consider the age of Church Fathers to be over at all and it includes later influential writers in the term. This page was last edited on October 5, 2012, at 21:33. This page has been accessed 90,522 times.